The most popular lodge tour in Africa! This accommodated tour from Cape Town to Victoria Falls was designed for those who prefer a bit more comfort while travelling in Africa. Clients overnight in comfortable twin rooms in hotels/ lodges or permanent safari tents. 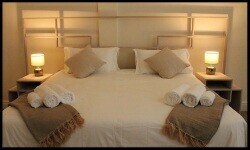 All rooms offer en-suite facilities with hot water showers and “normal” toilets. This is of course still a tour with an adventurous nature and the accommodated option should be seen as an upgrade of the camping tour. There are lots of good reasons why this is still the most popular tour in Africa. On this tour highlights will include safaris in the national parks of Etosha and Chobe, the Okavango Delta, the spectacular deserts of Namibia and one of the 7 natural wonders of the world- the Victoria Falls in Zimbabwe… to name just a few. 2. Camping: Clients mostly overnight in comfortable two-man dome tents, with built in mosquito nets and of course a mattress… and a couple of nights are upgraded to budget rooms. Click the link for all the info. We start our Cape Town to Victoria Falls lodge tour as we make our first stop at Table View for some photos of Table Mountain from across Table Bay. The Cederberg region not only boasts spectacular mountains and orange farms, but it is also the home of the Rooibos bush and today we will visit a working Rooibos tea farm and see the plants of Rooibos and Buchu that occur naturally in the wild. Indigenous to the mountain slopes of the Cederberg, this herbal beverage has earned an international reputation as a healthy and refreshing alternative to regular tea. A dinner at our overnight stop offers an opportunity for us to get acquainted while enjoying some South African hospitality. Namaqualand presents us with our first experience of the Desert vistas that will accompany us in the days ahead. We continue our tour north and after a short stop for supplies in Springbok, we travel to our camp on the banks of the Orange River. If you are fortunate enough to be travelling in the spring months (July to September) you may encounter the wild flowers that have made this region famous. No matter the time of year though, the strange desert views offer a unique backdrop to this day’s travel. While the Orange River was named after the Dutch Royal family, in recent times it has been referred to by its original name of Gariep, which simply means “river” in the indigenous KhoeKhoe language. Beginning its journey in the mountains of Lesotho, the Orange River is the longest river in South Africa and offers a unique contrast to the desert landscapes along its banks. The best way to experience the river is by getting out on the water and this morning we have the opportunity to join an optional canoe trip on the river. Around midday we depart the Orange River and head inland, crossing the border into Namibia. We make a brief stop at the mineral hot springs for a dip in the pool before arriving at our camp. We get up early this morning and make our way to the rim of the Fish River Canyon. We arrive in time to catch the morning sunrays filter through the canyon. After stretching our legs with a gentle walk along the rim of the canyon, we turn west and head for Keetmanshoop. Our afternoon will be spent meandering through the Quiver Tree Forest and The Giants Playground, which is named for the way in which the massive dolerite boulders have been placed on each other - creating rock formations and a series of mazes. Every overland tour has some long travelling days and today is one of those as we venture deeper into the Namib Desert. Our destination is the dune fields that cover the western reaches of the desert. Long dusty roads and sparsely populated farmlands offer us an insight into the vastness of rural Namibia. From the grasslands in the east to the red dunes of the west, the slowly changing landscapes represents the many faces of this desert country. Tonight we overnight on the doorstep of the dune fields and fall asleep to the unique calls of the elusive Barking Gecko. Our final day in the Namib desert continues as we join a local expert for an educational desert excursion. Reluctantly we leave the Namib behind and after a stop to mark our crossing of the Tropic of Capricorn, we travel to the Atlantic coastline. Today we continue west and make our way to the coastal town of Swakopmund, where adventure and a dose of civilization await. We make a brief stop at the Walvis Bay lagoon, where we hope to catch a glimpse of the Flamingo’s that feed in the shallows. 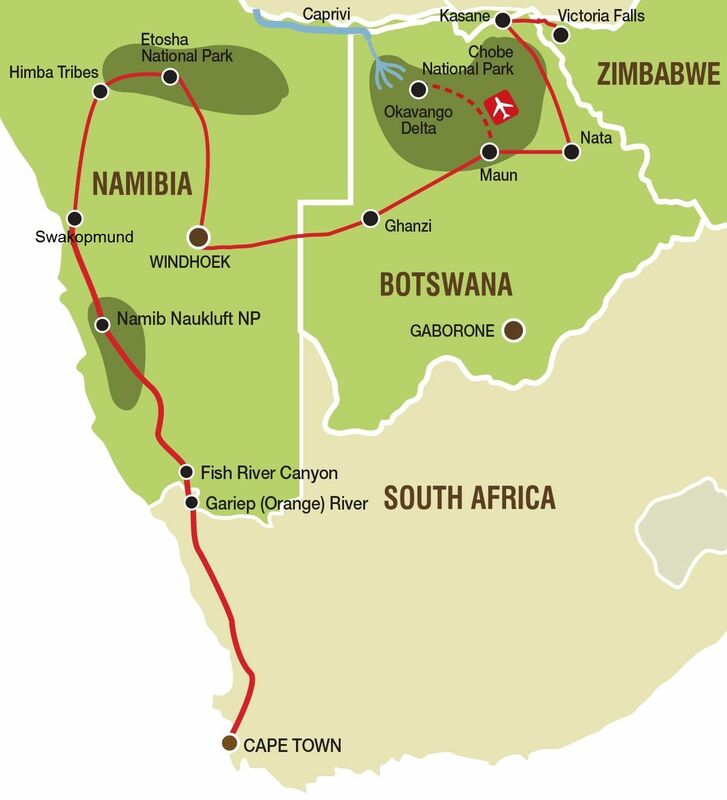 Arriving in Swakopmund we will have the opportunity to book some of the many adventure activities on offer. While for many it is the adrenaline fueled adventures that will grab their attention, Swakopmund offers all that and more. Take the opportunity today to explore the town at your leisure, as there are a number of attractions for every taste. Not to be missed is the selection of famed coffee shops and bakeries that offer a delightful range of German inspired treats. Swakopmund offers all the conveniences of a small city and is the perfect launching pad for the journey through the northern reaches of the land. The Brandberg (meaning Burning Mountain) are regarded as the highest mountains in Namibia and home to the famous White Lady, one of more than 45,000 rock paintings in the area. This morning we will make the 1-hour hike to visit the painting that is said to be around 2,000 years old. (Please be advised that the hike does traverse rough terrain along the gorge of the normally dry Tsisab River). After exploring the area, we continue our tour to the area of Kamanjab. Off to Windhoek we go. Windhoek is the capital city of Namibia. Upon arrival in Windhoek, we will take a short walk through the city centre and have the opportunity to view some its better known landmarks. (Our accommodation for the night is situated halfway between the city and the airport). * Those guests who have pre-purchased the Okavango Delta upgrade package will be transferred into the Delta upon arrival in Maun and will re-join the group on the morning of day 17. See all the details here. We leave Maun behind us this morning (and re-uniting with those that chose the upgrade package) we make our way towards the town of Nata. We will spend most of the day in our truck as we journey across the northern reaches of the Makgadikgadi Pans. Our activity package will afford us the opportunity to enjoy an afternoon guided game drive (safari) to the Nata Sanctuary, which forms the breeding ground for a host of water birds including pelicans and flamingo in their thousands. We rise early this morning as we continue north to our lodge on the banks of the Chobe River. This afternoon is set aside for exploring the Chobe National Park. We begin our exploration in 4x4 vehicles, which allows us an up close and personal experience with the many elephants that frequent the river in the afternoons. The afternoon ends with a leisurely boat cruise and a meal served around the campfire. Your tour comes to an end after breakfast and with the many activities on offer in Victoria Falls, today is the perfect day for the adventure that most suits your style. Whether rafting the mighty Zambezi River or enjoying a flight over the Falls, this is your day to enjoy the many attractions on offer in Victoria Falls. How do I get back home after this tour? Option 1: The day after the tour ends, the overland truck will start a 2 day long Transfer from Victoria Falls, through Botswana, back to Johannesburg. You can then book your international flight back home from Johannesburg. Option 2: Book a flight from Victoria Falls (Zimbabwe) to Johannesburg (South Africa). This flight takes around 2 hours. From Johannesburg it should be easy to get an international flight back home.